John Romita Sr.’s Legendary Cover – Remastered and Recolored! New York, NY—September 30th, 2016 — This November, the Parker family is wallcrawling and webslinging their way into hearts and minds in the pages of AMAZING SPIDER-MAN: RENEW YOUR VOWS #1! Legendary Spidey scribe Gerry Conway returns to pen the adventures of your friendly neighborhood Spider-Man alongside blockbuster artist Ryan Stegman – and Marvel is celebrating by revisiting one of the most iconic Marvel covers of all time! 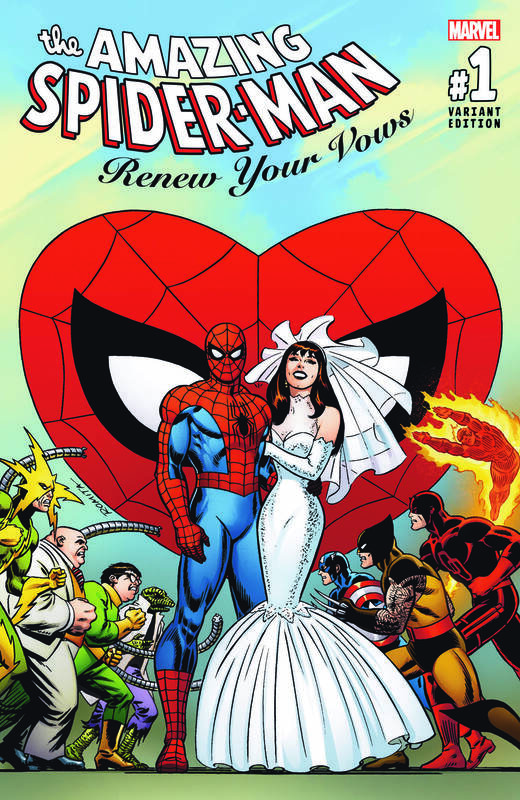 As this family of spiders swing headlong into Marvel NOW!, relive the wedding of Peter Parker and Mary Jane Watson with a variant cover by comics legend John Romita Sr. (AUG168911)! Masterfully recolored by Richard Isanove – this iconic classic comes to life once again! Be there when being Spider-Man becomes a family affair as Peter, MJ and Annie swing into action in AMAZING SPIDER-MAN: RENEW YOUR VOWS #1. Don’t miss the debut issue everyone will be talking about when it comes to comic shops and digital devices this November!